SLEEP ALLERGY FREE & GET UP TO 25% OFF! SLEEP ALLERGY FREE & GET UP TO 25% OFF! Do you know how little it costs to make a spring mattress?!?! Total costs to make a spring mattress is $120 +- and they sell them to you for $500, $1000, $3000!!!. Yeah, a memory foam bed isn't much different! Take a deep breath, because we'll help you make your way through the gauntlet of mattress salesmen and false advertising. 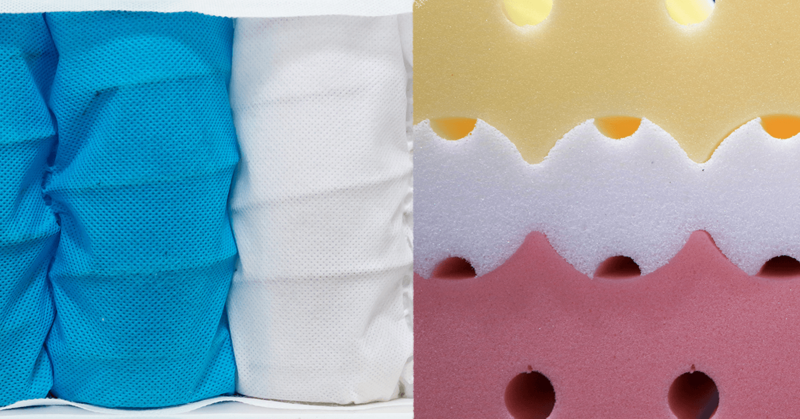 Let's take an in-depth look at the comparison between a spring mattress and the popular memory foam mattress, plus a bit more about natural memory foam! We've compiled pros, cons, and comparisons between innerspring mattresses and memory foam mattresses. Spring mattresses may give the illusion of comfort at first, with those fancy pillow-tops, but as the image shows they do not offer sufficient pressure point relief. The image is actually a pressure map of a person lying down on a spring mattress. See all that RED? Those are areas when your body feels the most pressure points. These pressure points equate to the pain in the shoulder and hip area when you wake up or the tingly “dead arms” from the lack of blood circulation. How does this pressure occur? Spring mattresses push back against your body, all with the same force that your body weight is applying to the mattress. Proper support is unachievable because your body does not push down evenly, meaning areas that carry more weight will push down into the mattress more than others. It results in uneven support which causes pressure points. These pressure points lead to poor blood circulation, tossing and turning, aches and joint pain. This is not the definition of a good night’s sleep! Fact: Spring mattresses lose 16% of their support in the 1st year alone. Good quality memory foam mattresses distribute body weight evenly, like having billions of little springs supporting you. Pressure points are significantly reduced, up to whopping 80%, which only memory foam can provide. Tossing and turning is the leading cause of a poor night's sleep which is drastically reduced with a memory foam mattress. As illustrated in the image, pressure points are significantly reduced up to 80%! - Pressure is measured in mmHg. In the healthcare industry, 32mmHg or lower is considered to be a pressure relieving surface. - Memory foam mattress rate around 15 mmHg. - Spring mattresses can rate well over 32 mmHg, which is the highest limit to be considered a pressure relieving surface. Meaning on a spring mattress you get no pressure relief, as the springs considerably push back against your body causing numbness. Fast Fact: The lowest mmHg on the market is provided by Essentia memory foam mattresses at 12.43mmHg @ 200lbs. If a quick glance at the chart above wasn’t enough, you can read on to see all the pros and cons of spring mattresses and memory foam mattresses. 1) Low Cost - Given that spring mattresses don’t cost much to manufacture; you can find spring mattresses at bottom dollar prices. The only time you’ll pay less is probably a futon or a hand-me-down. 2) Durability - A spring mattress can last between 7 and 10 years. 1) Loss of Support - Spring mattresses usually begin to sag after 1-2 years. In fact, they lose 16% of their support in the 1st year alone. 2) Sketchy Warranties - Spring mattress warranties allow up to 1.5 inches of normal body impression. However, it is normal for your mattress to get a body impression, as it can mean the “comfort layer” is conforming to your body. Be sure to find out the exact terms of your warranty before purchasing, and the steps that will need to be taken to qualify your possible issue as warrantable. 3) Poor Back Support - Innersprings do not offer proper back support and do not address spinal alignment. 4) Painful -Spring mattresses do not distribute your body weight evenly. Because each spring pushes back with the same force, pressure points are inevitable. 5) Not Hypoallergenic - The fluffy polyester top and the empty space in-between the springs creates a perfect nesting ground for dust mites. 1) The Low Cost - You can still get a durable memory foam mattress for under $950. 2) Pressure Distribution - It relieves pressure better than any other type of mattress. 3) No Motion Transfer - No jiggle or bounce means no transfer of movement or waking up your partner when someone needs to make a midnight bathroom run. 4) Hypoallergenic - A solid block of foam means dust mites can only live on the surface and not inside. 1) Price - Top memory foam mattresses can be expensive depending on quality and brand name. Cost is typically directly associated with quality because the materials are costly, not the labor. 2) Quicksand Like Feel - Because a memory foam mattress adjusts to the contours of your body, the foam can take longer to contour to your body as well as bounce back to its original shape. This can leave some feeling like they are stuck in the mattress or like they are sinking into quicksand. 3) Temperature Sensitive - Most memory foams rely on your body temperature to be able to contour to you, the problem arises as with the lack of air flow through traditional memory foam mattresses. You can wake up a sweaty mess. 4) The Smell - Some memory foam mattresses are made with poor quality foams and may have a pungent, unpleasant smell when new. Springs act as a shock absorber and reduce the wear and tear of the mattress. Springs or coils used in mattresses are available in four different types which determine firmness and support: continuous coils, Bonnell coils, offset coils and marshall coils. These are also measured by the gauge of the coil. The fewer coils you have, the thicker the spring. 14 to 15 gauge coils will give in easily to pressure, while a 12-gauge coil is the thickest and will feel firm. Memory foam mattresses can be firm to supple. Since a memory foam bed distributes your weight evenly, a firm memory foam mattress should still give you the firmness you are looking for without compromising your back, hips, and joints. Simply adding a memory foam topper won't give you the weight distribution that a high-density memory foam mattress offers. Memory foam mattresses become more supple with body heat, while this ensures the cradling support your body requires, you should also realize that when it comes to memory foam you most likely won’t find something firm enough for your tastes if you enjoy sleeping on the floor. In the charts above we mention temperature sensitivity, but what does it really mean based when comparing spring and memory foam? Memory foam is known for being temperature sensitive, or that it reacts according to your body heat. This can be a negative as it takes time for the foam to adjust to your body. This delayed response time or quicksand-like feel is a common complaint among memory foam mattress owners. The temperature of the room will also have an effect on the feel as well, as the colder the bedroom the longer it will take for the foam to adjust and recover. At freezing point, memory foam can become rock hard. On the flip side, memory foam can also trap heat which is another common complaint of memory foam mattress owners. The warmer the room and mixed with your body heat, the more chance you will be sleeping hot and waking up sweating. Spring mattresses don't adjust on body temperature unless they come topped with memory foam. The top layer will add comfort and support if made with enough quality memory foam. Fast Fact: The only memory foam that remains consistent in average room temperatures is Essentia's natural memory foam, which has been tested to sleep on about 7 degrees cooler as it allows air flow through the mattress. A traditional spring mattress doesn’t adjust or feel differently based on body temperature unless they come topped with memory foam. The top layer of a spring mattress is generally known as the comfort layer, and some companies with add memory foam to enhance the perceived comfort, support and quality of the mattress. Spring mattresses require more maintenance as they must be rotated once every three months for even wear. This way you don’t get dips and indents over and above the normal body impression. You will also want to avoid folding or bending a spring mattress, as you will compromise the springs and break it. Memory foam mattresses do not have to be flipped or rotated. There is no maintenance required apart from keeping the cover and sheets clean. Spring mattresses should have died in the 80's, like parachute pants and leg warmers, but they have remained popular because of their low-cost and high-profit margins (100%+). They also need replacing every 3-10 years which is great reoccurring income for Sealy, Serta, Simmons, Spring Air etc. The Better Sleep Council suggests that a quality mattress should provide 8-10 years of good support and comfort. With an average person spending 30% of their life sleeping, the importance of a healthy and supportive mattress cannot be ignored. A good quality mattress is important for healthy living and this applies to adults, the elderly, young children, and babies. How you feel and act is directly affected by how well you sleep. A quality mattress may be pricey but it will certainly keep your body well supported and comfortable for close to 20 years. We hope that you now have a better understanding of the difference between spring and memory foam mattresses. If you’re leaning toward memory foam, you’ll definitely want to take a look at Essentia’s natural memory foam mattresses that offer comfort, support and even address the common complaints of memory foam mattress owners. If you're serious about getting serious sleep and want some of the best mattresses in the world, we've got you covered. Celebrities, pro athletes, and even health gurus sleep on Essentia mattresses. They found a perfect fit and you will too. Do Memory Foam Toppers Work? Mattress Buying Guide and Tips What is a Memory Foam Mattress 5 Things to Know Before Buying a Natural & Organic Mattress Finding the Best Mattress for Back Pain How to Choose a Memory Foam Mattress What is an Organic Mattress? Mattress Size Comparison What's a California King? How Long Do Mattresses Last? Benefits of Organic Sheets How Does Memory Foam Work?